Absolutely fabulous ! very easy to use, no cons, only pros. erm ... am i the only one having problems using it IE8. the main controls are being pushed beyond the bottom of the window where i can't acess them. and line-height for the grid header it allways jumps back to standard value (on ie and ff) no matter if i press apply or not. What i'm doing wrong? 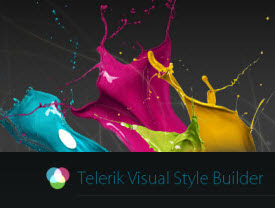 A side-note: you can use the style builder forum (http://www.telerik.com/community/forums/aspnet-ajax/style-builder.aspx) to submit bug reports and questions. Hi, what about the "Common" folder? it is not included in the downloadable zip file... and the loading.gif images are not shown during async calls. Like RadTimePicker, RadAsyncUpload, RadDateInput, RadDatePicker.. Anybody, any help please ?